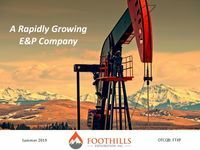 Foothills Exploration, Inc. (FTXP), is a growth stage oil and gas exploration and production (E&P) company with focus on the acquisition and development of undervalued and underdeveloped properties. The Company’s assets are located across well-established plays in the Rocky Mountain region. Foothills’ strategy is to build a balanced portfolio of E&P assets through two core initiatives. The first is to actively focus on acquiring dislocated and underdeveloped production and development properties then maximizing those assets to create shareholder value. The Company’s second initiative is to generate high-impact oil and gas exploration projects. © 2019 Foothills Petroleum, Inc.